Get ready for your psychedelic trip to Nirvana - Psytrance Evolution is here! Dive into the studio with the best sounding samples and loops for the style that is taking the world by storm; Psytrance! We recorded many hardware synthesizers and used a lot of outboard processing to get the sound punchy and full, ready for the dancefloor. Our brand new trippy library features wild pulsating basslines, hypnotic riffs, acid melodies, psychedelic leads, stomping kicks and many more essential Psytrance elements. We also included breakdown and buildup melodies and emotional progressions to really drive the crowd wild. Get hyped with over 50 truly hypnotic bass loops that were created using world famous Roland TB-3, or explore new dimension of sound with plethora of arpeggio, synth and chord loops. On top of that, we recorded various vocal sessions and processed them into glitchy sounds that will raise your heartbeat! Don?t look any further for proper drum and percussion sounds - crazy amount of 177 sounds will keep your inspiration floating for hours and hours. 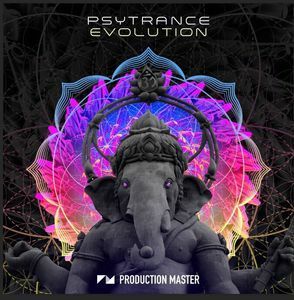 Punchy kicks, super tight snare and claps, bright hi-hats, hand-crafted percussions or weird glitchy samples - Psytrance Evolution has it all. Inspired by psychedelic tracks from Astrix, Astral Projection, Shpongle, Dragonfly, Infected Mushroom, Sesto Sento, G.M.S, Vini Vici, Vertical Mode, Ace Ventura, Talamasca, etc. This pack brings the right heat and energy to your Psytrance, Goa, Hard Trance or Techno productions. This library is simply massive - over 800 MB of top notch 24-bit content. Feel the stunning vibe of Ozora festival right in your own studio and make your own Psytrance banger with this stunning, easy to use library!